Here the player has dug a hole into which the apple has fallen. The player must now bang the apple with his shovel to force it through the hole. 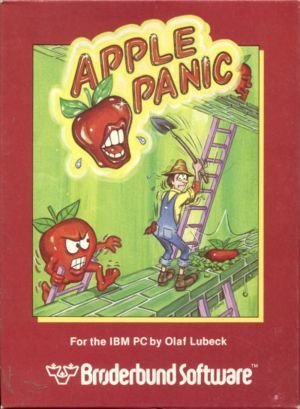 Description: The object of the game is to avoid being captured by apples and other "baddies". Once captured, the user will lose a guy. The player can move left and right and up and down on the ladders. The player can also dig holes and bang baddies on the head, but the player can also fall though the holes. Doing so, however, has no effect on the player. To advance in the game, the user must clear the board of bad apples. To do this, the user must dig holes into which the apples (and other baddies) will fall. Once an apple falls into a hole, the player must then bang the apple on the head several times until it falls though the hole; thus filling in the hole and removing the apple from play. If the player does not reach the apple in a set amount of time and bang it though the hole, the the apple can crawl out of the hole and refill it. As the player advances in levels, different baddies are introduced to the playing field. The only other baddie I can remember having encountered is the Butterfly. The player must eliminate all baddies from the screen in a set amount of time. Any time left when the player has killed off all the apples is given in bonus points. This page was last edited on 8 January 2008, at 23:20.